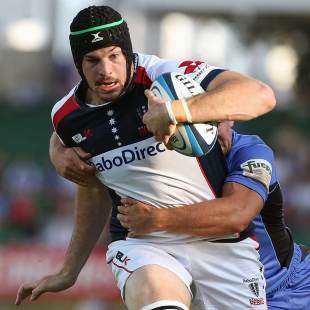 Hugh Pyle is back in full training with Melbourne Rebels after undergoing a shoulder reconstruction to correct the injury that curtailed his Wallabies ambitions in 2013. Pyle produced a string of quality performances for the Rebels in Super Rugby 2013 before dislocating a shoulder against Queensland Reds, the injury effectively ending his campaign. "I had minor surgery which allowed me to come back against the British & Irish Lions and Highlanders, but my shoulder wasn't up to scratch and so I had a full reconstruction," Pyle said. "I didn't want my season to end there; I wanted to push for higher honours. "I am back in full training now and I can't thank the physiotherapy staff and trainers enough for helping me get there. I didn't do any contact training before Christmas, which means my body feels great and I am ready for the full contact element now for the rest of pre-season and into the trial matches and Super Rugby." Pyle is enjoying working with the new on-field staff spearheaded by Tony McGahan and Bryce Cavanagh. "Tony likes to yell a lot, which is awesome, as we have a bunch of blokes including myself who need to be yelled at and put in their place from time to time," Pyle said. "He is very direct, but we all know that he knows what he is talking about; everything he tells you, he tells you for a reason. "Bryce Cavanagh, as head of athletic performance, is amazing. He has brought in some things, and taught us some things, that I have never seen or heard of being used in sport before, let alone rugby. He is a very smart man, and he knows what works and what doesn't. Everything that we do with him has a good application and relevance to the game." Pyle believes the new approach to training will reap rewards on the field after "2013 saw us, as a team, make another small step in the right direction" with maiden wins against the Highlanders, New South Wales Waratahs and Stormers as well as a double against Western Force in claiming their highest finish yet on the ladder - 12th. "We still had a lot of guys there from the first two years and we did keep building on what we had achieved over the first two years," Pyle said of 2013. "In saying that, we still weren't at the standard where we want to be so that leaves us with a burning hunger moving forward." Pyle's personal "burning hunger" sees him targeting his first Test appearance having been involved previously in numerous camps. "I definitely want to play for the Wallabies in 2014; that goes without saying," Pyle said. "I have been pushing for that since I started playing Super Rugby, and I think everybody playing for the Rebels is doing the same. To play for the Wallabies is what we all grow up wanting to do, and to achieve that at some point would be awesome. "If the club have five or six guys in the national squad, then that is a good marker of how we are travelling. Every player wants to make that breakthrough and there are definitely a lot of guys who had massive seasons in 2013, including some in their first season of Super Rugby, who will look to build on that and start to get rewarded with national selection."